“CO,” is an odorless, colorless gas that can kill you. 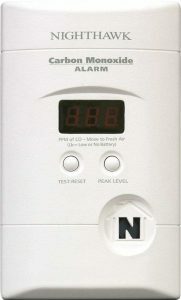 We can help, we sell Carbon Monoxide detector on our online store. John recommends this one for most homes. This is a plug in unit therefore you can install yourself. And also has a 9-Volt Backup as a result it keeps working even if the power goes out. We would be happy to come install a Carbon Monoxide detector. Call for pricing and make your appointment today. Did you know CO is found in fumes produced any time you burn fuel in cars or trucks, small engines, stoves, lanterns, grills, fireplaces, gas ranges, or furnaces. CO can build up indoors and poison people and animals who breathe it.